The history of Credo Christian High School reaches back to a meeting in November 1951 suggesting the need for Reformed Education. Many meetings later and after much "labour of love", William of Orange Christian School opened its doors on September 5th, 1955 with an enrollment of 58 students in grades 1 through 8. After considerable growth and numerous expansions the membership at a meeting in June 1971 adopted a motion to start a junior high school. In September 1973, this decision was implemented. Mr. S. VanderPloeg became the principal of the Junior High. In 1974, grade 9 was added and in 1975 grade 10 was added to complete the junior high grades. In 1977 the board was asked to investigate the possibility of adding grades 11 and 12. 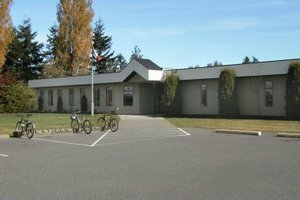 The consideration to add grades 11 and 12 prompted a decision to establish a high school in a separate building as a joint venture with the Abbotsford society (which operated the John Calvin School in Yarrow). Grades 8, 9 and 10 students, along with a newly formed grade 11 class, moved into rented facilities (from the Vancouver Bible College in Surrey) and started a new academic year in September 1978 under the name William of Orange Secondary School. In 1979 grade 12 was added and in June of 1980 the first graduating class of the combined schools was presented. In September 1980 the staff and students moved into new facilities on 52nd Avenue in Langley. The name was changed to Langley Christian High School, and then later on it was again renamed to Credo Christian High School. The following year the completed building was dedicated and so the work of teaching and learning took on a new sense of permanence. Enrolment at Credo Christian High school continued to climb. Staff were added and soon it was recognized that more programs were required to meet the needs of all the students. In May 1985 the membership approved a building expansion to include an Industrial Education shop, additional classroom, office and storage for an I.E. program. Through the generous support of Ladies auxiliaries, an extensive Industrial Education and Home Economics program was started in September 1985. At a membership meeting in October 1989 unanimous approval was given to proceed with a building program to add eight classrooms (to include new science labs, music room, and art room) as well as additional Physical Education change rooms. In May of 1991 this addition was virtually completed. In September '91 Band and Art programs were started. In September 1997, office and library expansions were completed. A computerized library system increased the possibilities for student learning. During the summer of 2000, renovations in the computer labs have enabled growth to include three complete labs, fully networked and online. Advancement into cyberspace has opened new opportunities for learning. In the foreseeable future, it appears that enrollment will decline. Economic realities and family pressures are impacting on the school. It is recognized that there is a need for each generation to claim the vision and to take ownership to develop Education faithfully in accordance with Biblical principles as understood in the Reformed tradition. Our school societies elect a Board of Directors from its own membership. The parents and other society members who serve on our Board and its committees are only one example of the parental support that our schools enjoy. Volunteers in our classrooms, libraries and offices have contributed many hours to reduce costs and convey a sense of community and school spirit to the next generation. Our schools subscribe to a covenantal understanding of our relationship to God and our neighbor. This covenantal relationship places us in a faith community and determines aspects of the financial organization of our societies. Our schools receive government funding equal to 50% of the public school cost per student. The school society raises the remaining funds for the operation of the schools by membership and tuition contributions. All wage earners, married, single, with children or without, are encouraged to support our Schools as members. This broad support makes Christian education for parents with children in school, more affordable. Tuition fees for members of the society are calculated per family, regardless of the number of children enrolled in school, and are based on the grade placement of the eldest child (either in High School or in any of the elementary feeder schools). The tuition fee levels are set by the boards of the participation elementary schools and are subject to annual review. Tuition pays for most of the educations services provided by the school. The board determines tuition fees for those who are not members of the society. Furthermore, a substantial amount of donations are very gratefully received. Maintain a central office for agencies that for ease of administration prefer not to deal with many individual schools. Credo Christian Elementary, the John Calvin Christian School, William of Orange Christian School and Credo Christian High School are all members of FISA through the Associate Member Group. The Combined Boards by joint agreement (through its External Relations Committee) selects an individual nominated for an elected position as director for the Federation. Langley is two entities: The City of Langley encircled by the Township of Langley. The area lies southeast of Vancouver BC (about a 50 minute drive) in the Fraser Valley. Outskirts are the U.S. Border to the south: the Fraser River to the north: Surrey to the west and the City of Abbotsford to the east. Population of Langley is about 24,000 (city) and the Township (including Walnut Grove and Aldergrove) about 94.000, projected to grow to 172,000 by the year 2026. The local economy is a mixture of more than 150 manufacturers, warehouses and agriculture. Dairy, livestock and berry farming enterprises abound. Horse breeding and riding stables are also prominent. Many residents choose Langley for its country setting and rural appeal. Toward the downtown core, in the Langley Valley Town Centre, is the Willowbrook Regional Shopping Centre. Langley City became a distinct area in 1955. It has a solid downtown core along the Fraser Highway, one of two routes that take up the Langley Valley Town Centre within the GVRD. One of the largest seniors' populations in Canada lives in Langley. The Township is home to the birthplace of British Columbia, the historic fur trade post of Fort Langley. The first Europeans to stay in the area permanently were the traders of the Hudson's Bay Company (HBC). In 1827, Fort Langley was built on the banks of the Fraser River, in the area now known as Derby Reach. It was one of a string of trading posts built up and down the Pacific Coast to compete with American fur traders for the rich pelts available in the region. In 1858, gold was discovered in the Fraser River in what is now the interior of British Columbia. With thousands of gold prospectors streaming into the province, the British government created British Columbia as a colony. James Douglas was sworn in as the new colony's first governor in Fort Langley, which was briefly the capital of the new region. The fort also became important as a supply station for the miners heading up the river toward the gold fields. When the capital was moved to New Westminster, Fort Langley's importance began to decline. The Hudson's Bay Company subdivided and sold its farm on Langley Prairie. Logging and farming replaced fur trading as the dominant local industries.